It appears that some slow - very slow - progress is being made in an important area of business, commercial real estate (CRE). According to a number of sources, the long downturn in CRE and CRE lending may have finally bottomed out. A report from the Federal Reserve indicates that commercial and industrial loans rose slightly over the last quarter, and that 12% of large banks indicated they have relaxed lending standards in these areas. Now this is not to say that we are in a true recovery - far from it. It does mean, however, that the “free fall” we have been in since 2008 could actually be over. In an article in Wall Street Pit (“Is the Slump in Commercial Lending Over”), author James Picerno evaluates the latest news in C&I lending and opines that “there’s a case for cautious optimism.” He explains that a rise in C&I lending would be one less negative factor in the economy and could help move us toward a real turnaround. He cautions, however, that this continues to be a “jobless recovery,” which makes expansion “vulnerable.” Still, Picerno feels this could be a positive sign for the economy. A report on the real estate website MortgageOrb.com reflects the some optimism and concern as Picerno’s article. This article summarizes the recent report from the Real Estate Roundtable on improvements in the CRE industry. Quoting Roundtable Chairman Daniel D. Neidich, the report points out that “Commercial real estate markets tend to recover from the top down, when higher-quality markets attract new capital and eventually other markets are affected.” But Neidich also warns that the slow growth in employment numbers continues to threaten a full recovery. Again reflecting some good news in CRE, the venerable Wall Street Journal’s Anton Troianovski points out in his article “Commercial Real Estate Coming Back - but Unevenly” that certain high quality markets are already seeing a rebound in values. He points out that in some markets CRE values have risen 30% from their 2009 lows and that a few select markets “are even approaching pre-crash levels.” As an example he lists the former Mortgage Bankers’ Association building in Washington, D.C., that sold recently for more than double what it went for a year ago. However, the rub is that, as Troianovski explains, “commercial-property values aren’t climbing uniformly across the country.” In many areas CRE property values continue to lag behind what they were financed for at the height of the boom. So what does all this mean to small business owners now? With interest rates still at some of the lowest levels ever and many property owners in distress, this could be the time to look into purchasing your own building. Many banks are trying to work with borrowers to avoid a foreclosure rush, but some owners will not be able to continue carrying these loans. If you are a business owner and plan to buy a building, get the longest term fixed rate loan you can. Even if you do not buy your owner-user building at the lowest market price, you will certainty be buying right since owning a building is more valuable to the entrepreneur than timing the purchase and the price in an uncertain market. Do your due diligence and study the opportunities, but if you are looking to buy commercial property for your business and you have the wherewithal to do it, don’t wait too long. 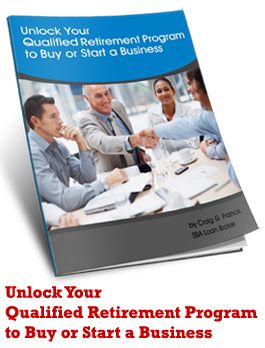 If you have questions on how you can use an SBA 504 or 7(a) loan to finance the purchase of commercial property, contact me at the links below. You can accomplish this with as little as 10% down and 25 year fully amortized financing if you qualify. Call me if you have an interest in pursuing a purchase to see how it can work. In a July 14 webinar on coping with distressed commercial real estate, Bob Coleman, founder of Coleman Publishing, spoke with Jon Winick, President of Clark Street Capital. In a clip from that presentation, Mr. Winick discusses the needs of banks in working with businesses and how the present selling is into a market with high IRR requirements. Many of those who bought into CRE in the last cycle are now distressed, and one problem they are seeing is over valuation based on the current regional market. Mr. Winick gives an example where the valuation is based on an assumption that is completely at odds with the reality of the situation. This is an interesting overview in a short video that shows why property prices have dropped, banks are afraid of commercial real estate and what buyers, both owner-users and investors, should be using as a measuring stick to price properties. There is more room for prices to fall, potentially 25% from present levels. Present levels are up to 40% lower than the market peak in 2007. Let buyers beware. Just as we have been looking at the Commercial Real Estate situation here, Bob Coleman of Coleman Publishing had the topic on his weekly radio show last Thursday. Bob Coleman's guest was Paul Elliot, a broker and founder of Quiet Auction, which specializes in the SBA-related CRE market. According to Paul Elliot, the coming bubble burst is based on a lack of jobs as well as a similar over-exuberant loan situation as caused the crash in the housing market. Both agree that the current downturn will not really improve until a serious program of job creation takes hold. Paul Elliot has several other interesting points about the economic situation as applies to CRE. I recommend that you take time to listen to the entire interview. Bob Coleman is a Small Business Lending expert and Founder of Coleman Publishing. Paul Elliot is a broker and founder of Quiet Auction, based in Riverside, CA. Craig G. Francis is the owner of Francis Financial and The SBA Loan Store. He has been a top producer of SBA Loans since 1981, and has worked with Dun & Bradstreet and Bank of Commerce. 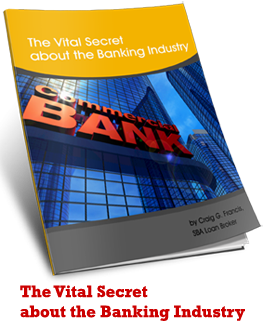 Craig Francis has the expertise to steer clients through the often confusing rules and regulations associated with SBA Loans, having helped over 2,000 businesses acquire over a billion dollars in loans. He can be contacted through CraigGFrancis.com, SBALoanStore.com or at 888-666-9722. Over the last 18 months we've seen the worst of the worst in the financial world. Few people have seen this calamity in their lifetimes. The exceptions are seniors who were born in the 1920s and lived through the Great Depression (GD) as children. However, there is no way they can equate the GD in an adult-like manner, as they viewed it through the eyes of a child. This means that what we are presently experiencing and seeing is unique to three generations. Even Ben Bernanke, just reapproved by a narrow margin as head of the Federal Reserve, was born in 1953. And he may be one of the foremost students and experts on the GD. So why does it seem like we are swimming in unfamiliar waters? Because we are! No one has had direct experience with the events of this current era. With those statements in mind, I am going to opine on commercial real estate and its values from a macroscopic view that encompasses the last 30 years. I've read extensively on the subject of commercial real estate values and the 1929 Great Depression – an event that was caused by almost exactly the same policies we find at the roots of this new depression. The experts’ opinions on where we are headed are diverse. Will the market value of Commercial Real Estate – CRE – continue its decline? Will it stabilize? Or increase in value? I answer yes to all these questions. But what is the direction of the values about which we ask? Up, down, or sideways? It depends on the type of CRE, its location, and the demographics and dynamics of rents, lending, the health of the economy, and the small businesses that comprise the vast bulk of CRE tenants. In this recession, unemployment is a strong driving factor in the drop of CRE values. Almost everything we see today relies on the health of the consumer and small businesses. A frightfully high unemployment level of 10%, with another 7.5% of underemployed workers and those who have given up and dropped off the roles, poses a serious drain on the vast complex of retail and consumer-based commercial properties and the tenants that fill them. As employment goes, so goes the value of CRE. I've read that CRE may have already dropped in value by almost as much as it increased in the last 4 years. In many cases CRE prices doubled or more in the last several years. CRE values started up in earnest in about 2002, as we were exiting the Tech Wreck, the recession of 2000-2002 and our post 9-11 malaise. Tenant rents ramped up as more and more commercial renters took advantage of space to start and grow their businesses. Profits of this era were substantial as business owners grew into an increasing amount of available space used to accommodate burgeoning successes in business. Looking around the landscape it seemed that there was a new shopping center at every corner, filled to the brim with cookie-cutter business models. Franchises and mom and pop establishments alike vied for space. Demand begat excessive rent demands, and the highest bidder got the space. Landlords increased rents due to the lack of supply of available space, and from that continued on a building spree. From 2002 to 2007 this growth of rental space plus business demand for space, coupled with a willingness to pay the asking price, drove prices of CRE skyward. The prices of CRE were sustained by many of the same factors that grew the sub-prime residential boom that metamorphosed into the crash we have seen over the last 3 years. Sellers jacked rents through the roof. Tenants paid the freight, and the income approach used in appraising values was generously supported by these supposedly good-quality tenants paying high rents in a booming economy. Capital was made available with little thought to quality underwriting. Commercial leasing, SBA loans, and collateral-based mortgages (evolving into commercial mortgage based securities, or CMBS) were all the rage. If you had the funds you could borrow millions, or even billions, on a non-recourse basis, so long as the property and its tenant income supported the loan. Underwriting was not based on the borrower but on the property. The lenders and borrowers thought that the price increases would sustain the loan security. Some properties were sold and resold in rapid succession over a period of only 3-5 years. Often the price doubled or tripled as investors tried to put their funds to work, relying on their unwavering faith in forever increasing rents, profits, depreciation shelter, and the certainty that the next borrower would gladly take this property off their hands at a large profit. Real Estate Investment Trusts (REIT) and Tenant in Common Investment Syndicates (TICS) bought with abandon, always confident that the income would continue unabated and tax sheltered accounting would make up the difference in the economics of the deal. In other words, all the parties turned a blind eye to the long-term economics of the deal – promising themselves that nothing that happened in the past would affect them today. They knew they were the masters of the universe. Some of us were around in the 1982-1987 time period when the Savings and Loan industry collapsed, due to the same investor mania we have been seeing over the last 5-7 years. The S&Ls of this period were being hammered by “disintermediation.” This hoary term is so old it does not even appear on my computer's spell check program. What it means is that the low loan rates in the S&L portfolio, such as the 6% conventional home loan rate, were as much as 2-5% below the rate the lender had to pay to get deposits. The losses to the lending industry were unsustainable. The S&L industry was dying for a solution to quell these losses, since this industry was mandated to lend only on home loans, a low margin business. The loan rates of the early 1980s period, with prime reaching 21%, were killing this vital lending resource. The S&Ls got some favorable legislation that allowed them to move outside their normal niche of home lending. When the laws were changed allowing for novel lending, the S&L's jumped into investing bank capital in CRE deals, counterbalancing the low rate loans in their portfolio. The yields were huge and levered by the fact that bank capital was co-invested with speculators into some really bad deals. This poorly thought out investment system made it possible for the S&Ls to get trapped into deals that were not fiscally or economically sustainable. The lender not only made the interim loan, but became a partner in the deal with bank capital on the line. In order to exit what could be seen as shaky projects, these region-based CRE projects had to be flipped at higher and higher values. These flips were aided by phony appraisals coupled with politicians who flew high cover for this conveyor belt of bad loans and fraudulent financing practices. Of course, you know this story ends badly. The same politicians who allowed the S&L industry to enter this investment format were also the ones who quickly saw that the generous depreciation allowances these investors got on their CRE purchases substantially reduced Federal tax revenues. This forced the change in the depreciation formula included as part of TEFRA, the Tax Equity and Fiscal Responsibility Act of 1986. The S&Ls, with massive amounts of bank capital embedded in these overpriced projects, got caught with their hands in the cookie jar. The desirable effect of accelerated depreciation on taxable income was eliminated. This left the last round of investors to discover the gruesome reality that there was no good reason to hold their investments. The tax shelter effect of rapid depreciation was touted as one of the best reason for buying into the CRE mania. Since their MO was to buy or build, hold for a short period to get the maximum depreciation from what amounted to 100% financing and no cash up front, and then flip this overpriced turkey to the next investor in line, the change in the law made a hash of their plans. They found that TEFRA not only made the ownership return a negative due to loan carry costs, but without this tax benefit supporting the next level of investment value, the CRE values plummeted. They and their S&L cronies got caught holding the bag. Voila, a crash in real estate values took place over the next few years, destroying the S&L industry and forcing a FDIC and government bailout that cost about $150,000,000,000. In hindsight, this cost was pocket change compared to the 1991-1995 debacle or the one we are presently experiencing. The results then and today are nonetheless the same as the value of CRE on a nationwide basis dropped by 35-50%. If we fast forward to 1991, we see the country experienced another bubble; partly a hangover from the 1980s period and partly a bubble of its own distinct making. While the S&Ls participated in some really bad deals and lost their shirts when their capital base was destroyed due to their unwise investment in these flip and skip CRE schemes, another group of investors, developers, and ultimate buyers was inflating the second part of the bubble. It was not one that necessarily involved the S&Ls. Yet it was another form of imperfect lending relying on a value-based market which was due for a fall. But this late evolving crash that lasted from 1991 to 1996 came about for a somewhat different reason. If we move away from the investors and focus on the developer market that was all the rage from 1981-1991, we see the owner-user and small development schemes that missed the S&L decline were still continuing their value increase due to robust demand for commercial property. What might have cost $40 a square foot in 1982 now cost $125 per square foot in 1992, the peak of this market. One could say this was a fairly normal value increase in light of inflation, but even this bubble popped with the 1991-1994 recession – an economic period characterized by Clinton-era tax increases, a 12% prime rate, and a recession that resulted from excessive taxes on business and personal incomes. Thus began another substantial drop in real estate values.